Vaughan Williams finished the degree work – what we now call A Cambridge Mass – in January, 1899 and was duly awarded the Doctorate in 1901. Despite talk of other honours in later years, he was proud to be known as Dr Ralph Vaughan Williams from that date on. Vaughan Williams’s period at Cambridge was to influence his character, friendships, ideals and musical development for the rest of his life. This is an important release which all English music devotees should hear as soon as possible. This CD is of greater historical and musicological interest than it is an exciting new and appealing discovery of an otherwise unrecorded work that’s typical of the unique flavors and colors of Ralph Vaughan Williams. Albion, the label of the Ralph Vaughan Williams Society, has done the still often misunderstood composer proud. It continues to do so with the present recording. Indeed, the Cambridge Mass, a surprisingly large scale work for a “test piece”, albeit his submission for doctorate in 1899, had not been recorded until this performance in 2011 after the conductor, Alan Tongue, transcribed over 150 pages from the unused manuscript in 2007. The Cambridge Mass – presumably so called because RVW’s time there had such an influence on him, as it did many of his illustrious contemporaries… Bertrand Russell, George Moore, George Trevelyan, John McTaggart and Roger Fry, for instance – has only the credo, Offertorium and sanctus, hosanna, benedictus; it’s scored for four soloists (S,C,T,B), double chorus and orchestra; it lasts about 45 minutes. It’s a robust work with few moments of introspection, wistfulness or the mellow sense of nostalgia that we associate with Vaughan Williams, for all that his music is actually much broader in scope and depth. The performers here have shown us – without fuss or fanfare – that the composer of A Lark Ascending, Job and nine superb symphonies had extensive technical prowess. Their playing and singing are acutely refined, paced perfectly, and full of an enjoyable blend of grace and trenchancy that implicitly foreshadow what the composer would need in the next 50 years in order to convey his world view to listeners way beyond what Elisabeth Lutyens famously dismissed as “cow-pat music”. Many are the passages where Vaughan Williams’ skills to set words and create the right musical structure are evident. The transition into the Et resurrexit [tr.s 2,3], for example: control is followed by measured exaltation. Yet it’s an exultation that has as much variety as it has tentative extroversion. The balance of male and female voices adds to the depth, the need for which a lesser composer might have ignored; or mismanaged. Yes, the Amen [tr.4] is drawn out in ways for which a more experienced composer might have provided innate musical reasons. But the performers take it at face value and avoid over-dramatizing it. Although it’s hardly necessary to couple the recording of A Cambridge Mass with the muscular yet equally elegant Blest Pair of Sirens of Hubert Parry, Vaughan Williams’ teacher, doing so reminds us that the visionary and transcendent The Dream of Gerontius was written at exactly the same time. Tongue and his forces, though, never try to stretch what this music will bear. No doubt borne along by the thrill of a live performance (in Croydon’s Fairfield Halls, with their sympathetic acoustic), soloists, choir and orchestra all revel in the outward-looking nature of the music, which is tempered with a sense that self-confidence is strongest when earned for good reason. Which was exactly Vaughan Williams’ case. A Cambridge Mass was, then, written as if to order. The University required certain components for such purposes: the length, forces (including double chorus), canon and fugue, for instance. Yet this performance refuses to emphasize the aspects of the work that the composer must have seen as core for their own sake (he famously made a list of the characteristics of the tuba and wrote them one by one into his Tuba Concerto). Rather, it skillfully makes the listener aware of the textures, melodies and scoring of which Vaughan Williams already showed great command. Ambition and zest. But directed as effectively as they were in the cases of Dvorak, Brahms and Schumann, with all of whom Vaughan Williams had made himself familiar by the time he wrote A Cambridge Mass. This is music to enjoy and become involved with – when comparing it with the sublime “Mass in G minor”, written a world away in 1921 – rather than lose oneself in; it lacks the transcendence of the later work. Yet is approached by Tongue and his forces without such pretensions. The booklet that comes with the well-recorded and well-presented CD contains all the background which a non-specialist (or indeed a Vaughan Williams aficionado) is likely to want. It has the full text of both works and brief bios of the performers. This ambitious project, indeed the work of the Society and Albion in general (each of their CDs contains a world première), is to be applauded and supported. Not least in the hope that Vaughan Williams will be more widely appreciated for the full and significant contribution to twentieth century music that he made. 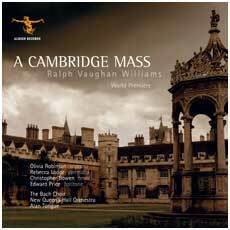 In particular, this CD shows how – as the late RVW expert Michael Kennedy said after this performance – “It is the real Vaughan Williams on his way to greatness”. Although the Mass lacks the wistful, the mellow and the deceptively gently curling reflection of the mature composer, it unassumingly invites us to perceive and appreciate his ability to mould a genre of supreme historical importance to his own ends. The full orchestra opens the work, andante maestoso, with a striking rising motif and the double choir immediately sings three times the word ‘Credo’. The first climax occurs on the words ‘et invisibilium’ and a brass fanfare rounds off the introduction. There follows an antiphonal section between the two choirs in canon to ‘Et in unum Dominum’ over a striding bass line that was to become a Vaughan Williams characteristic. ‘Deum verum’ shows the composer’s solid grasp of harmony as he builds towards another climax using suspensions. The climax on ‘per quem Omnia facta sunt’ is rounded off by an orchestral coda notable for its hymn-like melody. The brass fanfare returns, marked triple forte, to close this first section. Next comes an adagio molto, music that is more recognisably Vaughan Williams as we now know him. The four soloists, followed by the choir, use juxtaposed chords to create a visionary effect. The phrase ‘descendit de caelis’ inspires a clarinet obbligato, under which the soloists sing in counterpoint. The section ends with the unaccompanied choir singing ‘et homo factus est’. The spirit of Verdi’s Requiem is felt, with the contralto declaiming ‘Crucifixus’ over string tremolos. This is imitated in turn by the other soloists, the choir chant ‘Crucifixus etiam pro nobis sub Pontio Pilato’ and the section is rounded off by soloists and choir peacefully singing ‘sepultus est’. At the allegro moderato the tenor declaims ‘Et resurrexit’. Trumpets sound a fanfare and, against a timpani roll, a build-up from the orchestra leads to a rousing theme sung by tenors – ‘Et resurrexit tertia die, secundum scripturas’. This is treated in fugato style, the altos taking over from the tenors, then the sopranos. This theme is to reappear in the next movement. After a climax on ‘judicare vivos’ the music subsides for ‘et mortuos’ and the orchestra develops the triplet from the theme. A build-up of fourths leads to another climax on ‘non erit finis’ and the full orchestra plays the theme leading to a unison choral development for ‘et in Spiritum Sanctum’. Brass chords conclude this section. A sudden change of key takes us into a ‘Canon 4 in 2 (perpetual)’ on the phrase ‘et unam sanctam Catholicam Ecclesiam’, starting with the soloists, then the choir, quietly doubled by the strings. Vaughan Williams manages a complicated canon while at the same time producing a passage of extraordinary beauty. The music dies away and the basses strongly proclaim ‘et exspecto’ over string chords, the simple theme being taken up in turn by the other choral sections. Against another striding bass line the choir sing rousingly ‘et vitam venturi saeculi’ with the orchestra finishing on a dominant chord. Now comes the heart of the work, an eight-minute double fugue for choir on the word ‘Amen’, with Vaughan Williams revelling in all the contrapuntal techniques he can muster. There are six fugal expositions, with the subject based on the work’s opening rising figure and the counter-subject bases on the descending bass figure. Contrasting episodes are all linked thematically, with passages of block chords for contrast. The fugal devices of inversion and augmentation are used, as is stretto, where the entries speed up, piling in on top of each other. After a stretto maestrale, a molto più lento exposition, with the intervals compressed, and with rising and descending scale passages in the orchestra, rounds the fugue off quietly. The introductory material is now given to the choir alone, the soloists joining in at the top of the phrase and the orchestra ending with a fanfare. It is worth adding that the knowledge of counterpoint that the young Vaughan Williams had assimilated was used five years later when he was commissioned to write an article on Fugue for the Grove Dictionary of Music and Musicians. Variety is one of the hallmarks of this composition and Vaughan Williams scores the Sanctus, an adagio, for double choir accompanied by brass, timpani and organ. The two choirs are in canon throughout. Stately brass chords open the movement, then one of the choirs sings ‘Sanctus’ a capella, the soprano theme being imitated in augmentation by the basses. Two bars later the second choir joins in and the first half of the Sanctus continues on these lines, the antiphonal singing being lightly accompanied by horn and trumpet doublings of the vocal line. The next section ‘Dominus Deus Sabaoth’ introduces the timpani and organ, and continuing in canon the choirs build the sound picture. Over a tonic pedal they sing ‘gloria tua’, the texture clears and the brass close with the quiet chords. With full orchestral accompaniment, the choir launches joyfully into another double fugue for ‘Hosanna’, marked allegro. The movement ends, after all the fugal fun, in solid homophony. For this andante sostenuto movement, a first inversion string chord suggests that recitative is to follow, and whilst the bass soloist’s entry is marked quasi recitatativo ma in tempo, the other soloists enter one by one in counterpoint and a quartet movement is revealed. A reduced orchestra provides a visionary quality, with two each of flutes, clarinets, bassoons and horns, together with strings. The ‘Benedictus’ of the later Mass in G minor (1922) inhabits the same sound world. 9 Hosanna (finale): The work concludes in exuberant fashion with a repeat of the allegro ‘Hosanna’ fugue. Overall, A Cambridge Mass significantly extends our understanding of Vaughan Williams’ artistic development. The omission of the Kyrie, Gloria and Agnus Dei places the work firmly in the romantic genre of concert-hall works on liturgical texts rather than those with a devotional purpose. Vaughan Williams was to return to this approach with the Magnificat over thirty years later in 1932. Vaughan Williams said that: ‘Parry taught music as a part of life … There was no distinction for him between a moral and an artistic problem. To him it was morally wrong to use musical colour for its own sake, or to cover up weak material with harmonic devices. This is what Parry taught and this is what he practises’. (from The Music Student,1918). Parry’s setting of Milton’s ode At a Solemn Musick, composed in 1887 for the Bach Choir, is characteristic of the composer in its masterly scoring, with choral writing in eight-parts, and its use of contrapuntal devices which Vaughan Williams’ was to echo in his own A Cambridge Mass. However, Parry’s masterpiece also has both a lovely opening melody and a sense of nobility which reflects Vaughan Williams observations on his teacher and friend. Commissioned by Stanford, the work made an immediate impact. As J.A. Fuller-Maitland, a member of the choir put it at the time of the première: ‘I cannot now imagine how we ever got through it, so overwhelming is its emotional power and matchless beauty’. Elgar called the work: ‘That English masterpiece, amongst the noblest works of man’ and Vaughan Williams declared that Blest Pair of Sirens, bearing in mind the works of Byrd, Purcell and Elgar: ‘is my favourite piece of music written by an Englishman’.